IN CONJUNCTION WITH TOM JOHNSON AND 9X30 DESIGN IN ROCHESTER, NY, THIS 40 ACRE MILO VINEYARD IS BEING RETAINED, WHILE SIX LAKEVIEW RESIDENCES ARE CREATED WHILE HAVING MINIMUM IMPACT ON THE ACTIVE VINEYARD. THIS BUILDING IS DESIGNED WITH THE IDEA OF BEING A SECOND RESIDENCE FOR A SPECULATIVE BUYER AND IS A 5 BEDROOM, FOUR BATH STRUCTURE CONSTRUCTED BY LOCAL MENNONITE CONTRACTORS. THE CENTRAL FRAME OF THE NEW RESIDENCE IS MADE OF A REUSED LARGE-TIMBER BARN, WHICH WAS LOCATED IN THE NORTHEAST, DISASSEMBLED AND BROUGHT TO THE SITE. MODERN ALL GLASS BREEZEWAYS CONNECT THE NEW STRUCTURE TO THE OLD, WHILE LARGE SLIDING SHUTTERS CLOSE THE HOUSE FOR THE WINTER. THE FOUNDATION IS PLACED BASED ON THE DIMENSIONS OF THE EXISTING BARN COLUMNS AND ACTS AS AN EXPANSION POINT FOR THE NEW HOUSE. 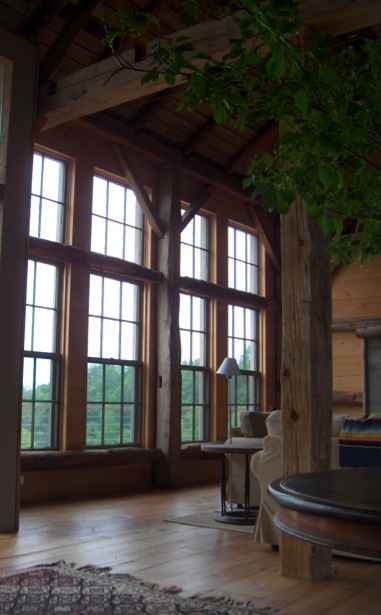 SUSTAINABLE METHODS ARE USED, INCLUDING THE RECYCLED BARN, RECYCLED SIDING, REUSED WINDOWS AND DOORS, WHICH EXCEEDS REQUIRED INSULATION STANDARDS, AND DOUBLE GLAZED WINDOWS AND DOORS. THE INTERIOR USES CONTEMPORARY FIXTURES AND NATURAL MATERIALS.